Quadrature modulation and demodulation is as commonplace and unremarkable today as were Space Shuttle launches before NASA cancelled the program in 2011 (eliminating America's ability to send astronauts into space). However, before integrated circuit implementation was available, it was a relatively rarely employed scheme. Yes, there were many applications using analog quadrature systems (I designed a couple of them myself in the early 1990s), but use with digital communications requires closely matched (amplitude and phase) pairs of mixers and power splitters / combiners, along with close tracking over time and temperature. The "magic" of quadrature systems is that due to the theoretical mutual independence of two signals exactly 90° apart (orthogonality), twice as much information can be transmitted in the same bandwidth of a single signal. Modern "M−ary" and "Q−ary" systems combine multiple phase and amplitude relationships of data bits to cram an incredible amount of information into a given bandwidth. As implemented in analog television receivers, quadrature circuits provided, in a single stage, good AM rejection, linear FM detection, plus a high-level output signal requiring no additional voltage amplification before the output stage. Fig. 1 - Applying signal only to the first input grid of a quadrature-type pentode, we can get good clipping in the plate output, with relatively low input levels, due to cut-off and sa1uration characteristics. This circuit develops audio in a way of its own -and also develops distinctive trouble symptoms. Rejection of amplitude modulation, detection of frequency modulation, and amplification are the requirements of a TV receiver sound circuit. Because of the nature of the 4.5 mc. i.f. signal formed by a beat between sound and picture carriers (a strong video AM signal is also present), good rejection of AM signals is essential. While unrejected AM in a straight FM receiver is usually noise heard after detection as "hash" in the higher audio range, unrejected AM in a modern TV receiver is mostly video signal and is heard predominantly as sharp 60-cycle buzz. As this buzz is made up of rectangular sync pulses, strong frequency components over a wide range are present, making normal limiting methods somewhat less effective than is the case with ordinary FM radio reception. Early intercarrier TV receivers required one or two limiter stages preceding the FM discriminator and at least one stage of audio amplification prior to the power-output stage. 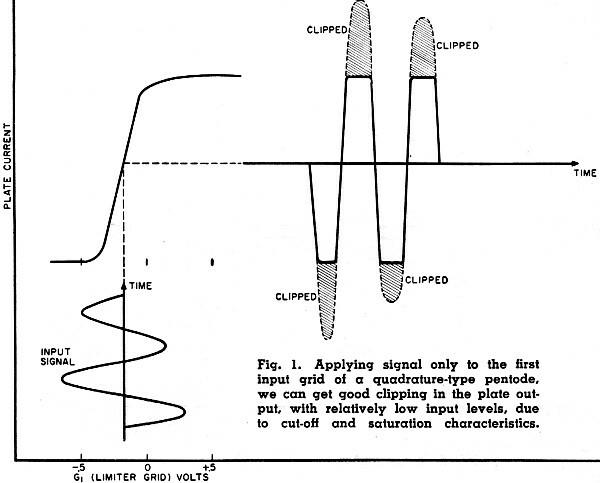 The AM rejection properties of the frequently used ratio detector reduced the number of limiting stages needed, while other designs featured use of the video amplifier for one stage of sound i.f. amplification and reflexing of the i.f. pentode as an audio amplifier to reduce the number of stages and components still further. Quadrature circuits provide, in one stage, good AM rejection, linear FM detection, plus a high-level output signal requiring no additional voltage amplification before the output stage. 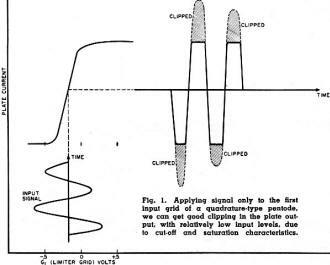 The excellent AM rejection provided by quadrature circuits is achieved by use of tubes having very sharp cut-off and saturation characteristics. Examination of the plate current vs grid voltage curve for a type 6BN6 tube (Fig. 1) shows that a change in plate current from zero to saturation is produced by a swing of less than 0.5 volt on the grid, any signal exceeding this level being effectively limited. It is also apparent from Fig. 1 that the plate output, after limiting, is essentially a square wave, with almost instantaneous changes from zero to maximum current. The effect of this grid (G1 can thus be considered as that of a switch for turning plate current on or off, with virtually no intermediate condition of conduction between these two extremes. While the operation charted in Fig. 1 illustrates the effect of signal on the G1 grid with other voltages being held constant, there is another grid (G3, shown schematically in Fig. 2 in the position of the suppressor grid, although it is not one such) whose action is similar to that of G1. We may think of these two grids as being switches in series with each other and also in series with the plate circuit. Thus if either of these switches is off, no plate current will flow: for the tube to conduct, both must be in the "on" position. Furthermore, each of these switches or grids is capable of opening or closing in response to its input signals . Fig. 2 - This circuit is generalized for both types of quadrature tubes. In addition to gated-beam tubes, like the 6BN6, there are other pentodes, such as the 6DT6, that have cut-off and saturation characteristics satisfactory for use in quadrature detectors. Since the exact circuit for the stage may vary somewhat depending on the tube type used and other factors, Fig. 2 should be regarded as a generalized circuit covering such detectors as a group. The sound i.f. signal is applied to control grid G1. The cathode bias resistor is adjusted so that the "on" and "off" conditions will produce plate-current pulses in the desired polarity for detection. In some actual circuits, the cathode resistor is made variable to be used as a service adjustment. Some of the energy introduced by the input signal at G1 is transferred to G3 and its resonant LC circuit. The latter is so tuned that, when energized, it will produce an oscillation at the sound i.f. center frequency (4.5 mc.) that is approximately 90 degrees out-of-phase (lagging) with a 4.5-mc. signal introduced at G1. This oscillatory voltage also acts as a switching potential. The effect of the switching action by the two control grids is shown in Fig. 3A for an input signal at center frequency. Each grid is shown to be in an "on" condition for about half of each cycle, with a pulse of plate current flowing only during about one quarter of a cycle, when overlapping of the "on" periods for both grids occurs. Switching conditions for input (G1 ) signals above and below the 4.5-mc. center frequency are shown respectively in Figs. 3B and 3C, where it is seen that the effect of a change in input signal frequency is a change in plate-current pulse duration. 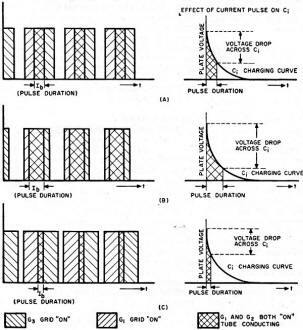 Each pulse of plate current produces a voltage drop across RL and permits Ci to discharge through the conducting tube for the period of the pulse. Between pulses, Ci recharges through RL. 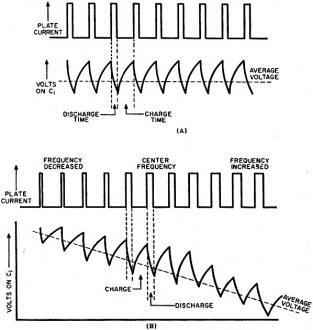 With an input signal at center frequency, Ci discharges rapidly for about one quarter of each cycle (Figs. 3A, right, and 4A) and charges at a slower rate during the remaining three-quarters of a cycle, as shown in Fig. 4A. As the signal frequency increases so that the pulse duration increases, discharging time increases and the time available for recharging decreases. Under these conditions (Fig. 4B, right), Ci will be discharged to a lower level, will take a smaller charge than in the previous case, and the average voltage across Ci will assume a steady state which is lower than was the case at center frequency. Similarly a decrease in signal frequency (Fig. 4B, left), will create shorter current pulses and a consequent increase in average voltage across Ci. Fig. 4B illustrates the effect on Ci voltage of a complete frequency swing from minimum frequency, through center frequency, to a maximum. It is seen that the amount of (modulation) frequency change determines the amplitude of the audio signal, while the rate at which these swings occur is, of course, the frequency of the audio signal. This is the essence of FM detection. Fig. 3 - Quadrature tube conducts only when both signal grids are "on." Output pulses are shown when the FM signal is on (A), above (B), and below (C) carrier frequency. Fig. 4 - With input at one frequency (A), average output voltage is steady. 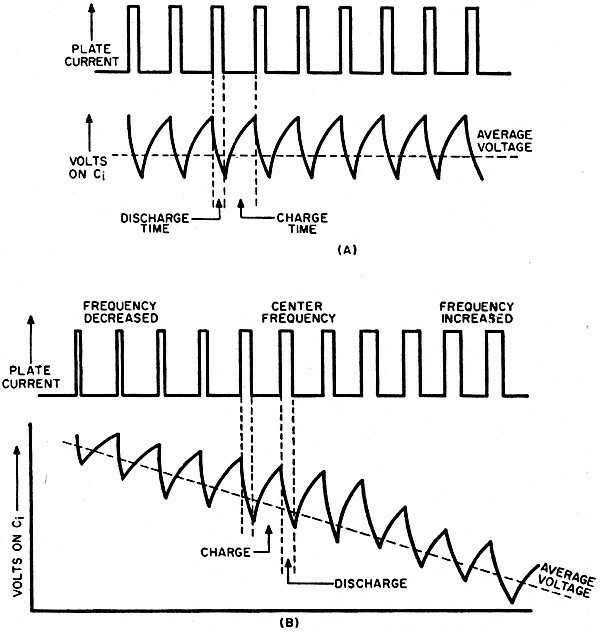 As frequency of input signal varies (B), there is a corresponding change in output voltage. Most service problems with this type of circuit stem from misalignment of the tuned circuits. Comparatively few components are involved, voltages and currents are small, and complete breakdown of any component is therefore rare. However, very small changes in component values are sufficient to affect the alignment of the circuit, producing such symptoms as distortion and reduction or loss of output. 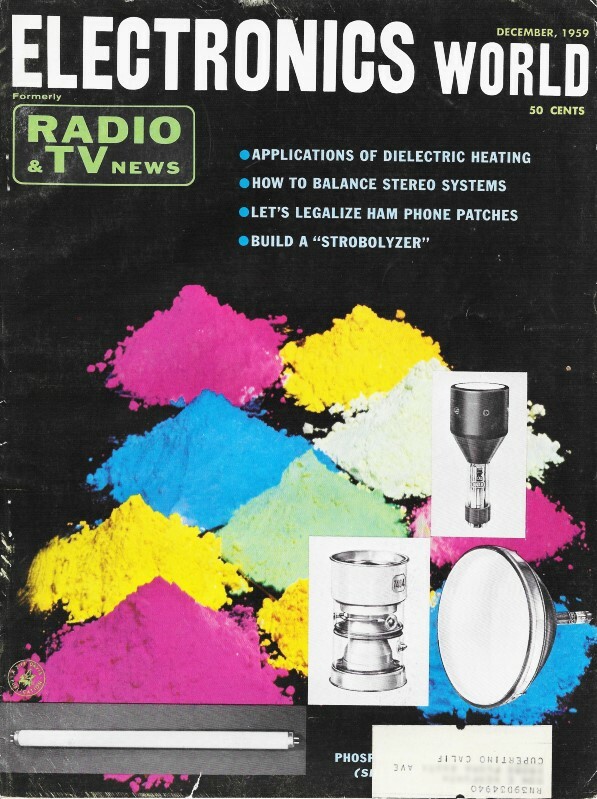 Cases of slight distortion or reduced output can, therefore, often be corrected merely by slight adjustments. It is interesting to note that, in a recent series of complaints of inferior sound involving quadrature circuits investigated by the author, six out of eight proved to be the result of front-end (tuner) oscillator mistuning, while a tube failure and a defective multiple-set installation accounted for the other two. Each complaint had been reported by a technician as trouble due to a defective quadrature circuit that he was not able to correct in the home. 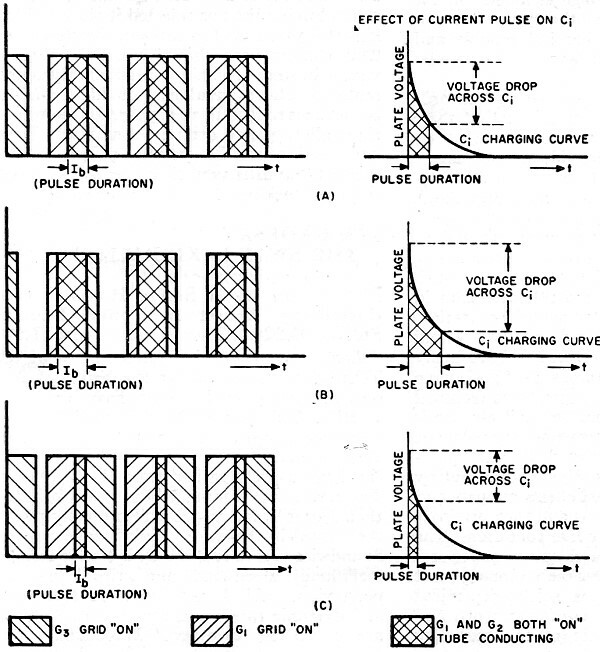 Aging of tubes causing slight changes in inter electrode capacitance or changes in the grid characteristics will also throw the circuit out of alignment. This makes it good general policy to install a new tube first and try to align the circuit when trouble is encountered. If good sound is then produced, the old tube may be reinstalled and slight changes in alignment made, before deciding whether or not to discard the old tube. Alignment made on a strong, clear station will not necessarily be good under less favorable conditions. A ghosty, weak, or distorted signal requires very accurate alignment, which is best made on the worst station. Antenna systems, particularly community distribution systems, can create serious trouble if the original relation between sound and video amplitude is not preserved. It may even be found that a particular station does not maintain customary modulation and amplitude levels, making it essential to align all sets on this transmission. A change in audio quality and volume is sometimes noticed as the set warms up. Most likely cause again would be the tube, but drift in the quadrature-coil capacitor produces the same effect. Heating the capacitor with a solder gun will reveal any tendency towards drift - but the gun must be removed and the result checked under cooling conditions, if stray detuning effects of the gun tip are to be avoided. Loss of sound as the contrast level is reduced may be encountered. Most likely causes would be: an open bypass capacitor in the video-output cathode circuit, a defect in the sound take-off circuit, or a video-output tube plate-circuit component, or, once again, alignment. Another possibility is loss of plate-supply voltage without loss of supply to the screen. The plate supply only, in some models, is taken from the boosted "B+" to prevent operation of the sound circuit before the a.g.c. circuit is operative. This boosted "B+" voltage is dropped and filtered in an RC network handling high peak voltages that may cause trouble. 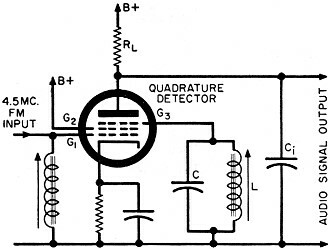 The trend towards quadrature detectors has now developed to the stage where circuits of this type are used by a majority of manufacturers, but there does seem to be a dislike of the circuit by many service technicians. A better understanding of operation and of what defects may occur may help dispel the attitude.